Rev. 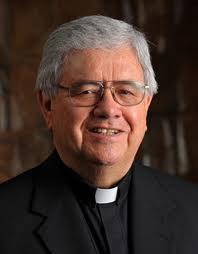 Virgilio P. Elizondo, the University of Notre Dame Professor of Pastoral and Hispanic Theology, died Monday (March 14). He was 80 years old. A member of the Notre Dame faculty since 2000, Father Elizondo was a native of San Antonio, Texas, where his Mexican immigrant parents owned a grocery store and where he himself spent many years as the pastor of San Fernando Cathedral. The Sunday Spanish Mass at which he presided was televised and carried via satellite from San Fernando Cathedral to more than 1 million households. Before being ordained a priest for the Archdiocese of San Antonio in 1963, Father Elizondo was graduated from Saint Mary’s University, where he majored in chemistry and considered applying to medical school. Deciding that he was called to the priesthood, he entered Assumption Seminary in San Antonio, largely because he wanted to stay in his hometown. During his early years as a priest, Father Elizondo worked in parishes, but his ministry took a more scholarly turn in 1965 when Archbishop Robert E. Lucey appointed him archdiocesan director of religious education. Father Elizondo also served as Archbishop Lucey’s translator and aide during the 1968 meeting of Latin American Catholic bishops at Medellin, Colombia. Father Elizondo became prominent as an advocate for the underpaid and exploited Mexican-American laborers in his archdiocese during the early 1970s. In 1972, as an increasingly self-conscious and confident Mexican-American community began to assert itself politically and culturally, he established the Mexican-American Cultural Center at Assumption Seminary. Father Elizondo’s scholarship, a theological consideration of Mexican-American culture, produced numerous books, including “The Future is Mestizo,” “Galilean Journey” and “The Human Quest.” He received two doctoral degrees in theology from the Institut Catholique in Paris in 1978, and in 1979 he became an editor of the international theological journal Concilium. Among numerous other honors for his scholarship and ministry, he received Notre Dame’s Laetare Medal in 1997. A memorial Mass will be celebrated at 4 p.m. April 7 (Thursday) in the Basilica of the Sacred Heart. Notre Dame president Rev. John I. Jenkins, C.S.C., will be the presiding celebrant, and Rev. Daniel G. Groody, C.S.C., associate professor of theology and the director of immigration initiatives at the Institute for Latino Studies, will give the homily. Originally published by Michael O. Garvey at news.nd.edu on March 15, 2016.